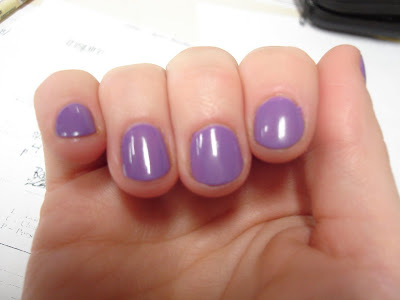 short & sweet ( and perpetually polished): Opi Grape Fit.. Here's a polish I picked up over the summer when I was on vacation. I love to bring back souvenirs, and what better than nail polish! Everytime I wear it, I'm reminded of the vacay (I went to Bringantine Beach, by the way) I present to you Opi Grape Fit. Before this color, I was not a fan of purple nail polish, I'd worn it maybe twice in my life, but since picking this up in june, I've already sported about 4 purple mani's this summer. Maybe it's because it's not a true purple, its kind of dusty looking, but that's why I love it!